Part Three! Written and shared by Al Bulgawicz. Thank you Al! Now that you have the horse and the basic equipment, how does it work? What do I do and how will I be judged? The CDE is a 3 part event and the competitor must complete all 3 parts. In general, elimination from any competition will be elimination from the event. In some cases, the competitor is allowed to participate in the remaining competitions but with no score. The final score is based on the combined total of penalty points accumulated during each competition. This final score determines the overall placement for the event. So what do I do in each competition and how is each scored? Let’s go thru a full CDE since the other types of events are just variations of the marathon portion of the event. For a full 3 day CDE, the competitions will be done in order; one each day. If the event is to be held in 1 or 2 days, the Competition C or Cones will generally be held concurrently with the dressage competition. As soon as the competitor finishes the dressage test they will go immediately to the cones course for Competition C.
The marathon may be held in the afternoon for 1 day events or the next day for 2 day events. The number of expected entries usually determines the number of days for the event and this will be part of the published information about the event. A beautiful turn out for dressage. This mini is wearing our Comfy Fit harness. No matter whether the event is a CDE, DT or ADT the first competition will be the dressage. Some competitors feel the dressage is the price you pay to get to do the fun stuff, however, it is in fact the most important competition of the three because the score you receive will be the basis for your score in the rest of the event. The judge or judges will observe as you drive a preset test. They will score each and every element of the performance.. The raw score will then be subjected to a formula, based on the test and level of the competitor, which will convert it to a number of “penalty” points. The objective is to have the lowest score possible. The tests can be found on the ADS web site. The required test to be performed will be listed ahead of time in the show program or Omnibus in ADS terminology. VSEs will perform the dressage test in a 30 by 60 meter arena marked with letters exactly the same as those found on a ridden dressage arena. In some cases, VSE’s will perform the dressage in the 40 by 80 arena depending on the organizer and number of entries. . This will be indicated in the Omnibus. The object of the Driven Dressage Test is to judge the freedom, regularity of paces, harmony, impulsion, suppleness, lightness, ease of movement and correct bending of the horses on the move. 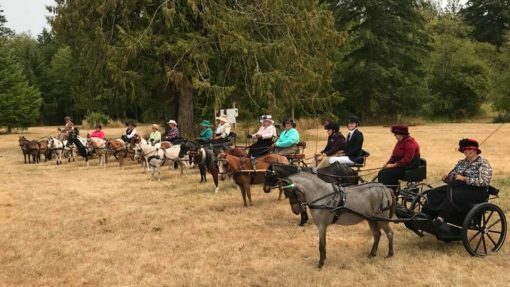 Competitors will also be judged on style, accuracy, and general control of their horses, and also on their dress, condition of their harness and vehicle and the presentation of their whole turnout. Each competitor’s start time will be posted before the competition begins and no competitor will be required to start before their posted time. In the event the competition is running ahead of time a competitor may voluntarily start early if they are ready. At the start time when the judge is ready they will ring a bell or some other signal. The competitor then has 90 seconds to enter the arena and begin the test. At the completion of the test the competitor will exit the arena. The judge will fill out a score sheet and send it to the official scorer to have the dressage competition score calculated and posted. Since the cones and marathon can only produce additional penalty points, the dressage score will be the basis for your overall score. Having a low score here will put you in the best possible position for an overall low score. Amy Blossom and Flirt running the marathon in their Comfy Fit Harness! The marathon portion of the event can be the most fun and also the most challenging. For a CDE there will be 3 sections to the marathon. Section A will be a timed warm up section to be taken at any pace. The next section is the Walk or Transfer section after which there will be a vet check. When permitted by the vet, the competitor will proceed to Section B which consists of a longer distance and 5 to 7 obstacles which must be successfully negotiated. For a Driving Trial, which is a shortened version of the CDE, Section A and Transfer will be eliminated and the marathon will consist of only Section B. In Section A and the Transfer section any pace is allowed. 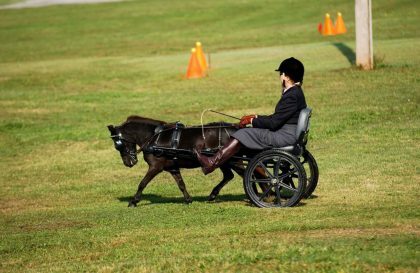 In Section B only walk or trot is allowed for Training and any pace is allowed for Preliminary and above. At all levels only walk or trot is allowed during the last 300 meters. For Training level, time in the obstacles is not kept and it is therefore only a part of the overall time on the course. For Preliminary and above the time in the obstacle is kept and added to the overall score as penalty points. For an ADT, the marathon will be replaced by a timed obstacle test. An obstacle will be placed at each end of the arena with a start/stop line across the middle of the arena. The competitor crosses the start line and negotiates the obstacle as quickly as possible and then returns across the stop line. Each obstacle is taken twice and the accumulated times are added to the overall score as penalty points. The horse must be well enough conditioned to trot the required distance at a prescribed speed. Each horse size and level of competition has a set speed. The VSE speed is set at 9kph. 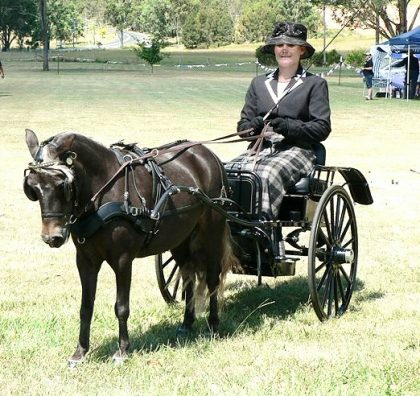 As a point of reference, this is slightly slower than a collected trot in the breed ring. Kilometer markers will be set along the course and it is the responsibility of the driver to accurately maintain this speed by using a stopwatch to calculate time and distance. One kilometer at 9kph will take 6 minutes and 40 second, however, horses are mot machines and adjustments will have to be made for the horses conditioning and endurance. You may want to bank time (go faster) in the early stages so that you can go slower at the end. You can always kill time by walking but making up time with an already tired horse is almost impossible. The course will be measured and a maximum time for each division will be posted. The competitor will have a 3 minute window ahead of the maximum time to complete the course. Times less than the minimum or greater than the maximum will incur penalty points. To ensure that the competitor follows the course and does not deviate or take shortcuts, mandatory sequentially numbered gates, consisting of a pair of markers, are placed along the path. Failure to pass thru each of these gates in order will be cause for elimination. The obstacles along the course will consist of a set of natural or man made objects placed so that there are 5 gates or openings thru which the competitor must travel. The gates will be lettered A,B,C, D and E with red letters on the right side and white letters on the left side. The competitor must negotiate the gates in order, without passing thru a gate that has not already been negotiated, with the red letter on the right. Missing a gate or passing thru a gate in the wrong direction or out of order without correcting before exiting the obstacle will result in elimination. Once a gate has been successfully negotiated it is considered dead and can be passed thru again in any direction without penalty. Training level is required to go thru gates A,B and C. Preliminary will also go thru D and Intermediate is required to go thru all 5 gates. The makeup and design of the obstacles is completely up to the imagination, determination and sometimes evilness of the course designer, however, the obstacles are designed to challenge the horse and competitor and not to create an unsafe situation. Obstacles may have water crossings but must provide an alternate path for Training level competitors who are not required to go through water. During the marathon competition all persons on the carriage must wear helmets and protective vests. 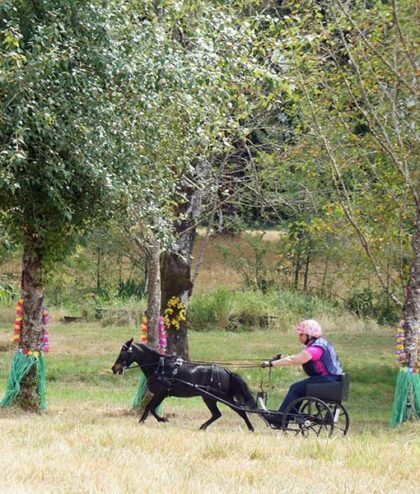 Sallie Wickens and her beautiful mini preparing to run the cones course in a Comfy Fit harness and a Hyperbike! The cones course is designed to test the agility of the horse and the driver’s ability to control the horse at a trot, or canter for preliminary and above, through a series of 20 pairs of cones. The width of the space between the cones is based on the wheel width of the cart, the level of the competitor and number of horses (tandems and three or more get additional space). The cones are numbered in sequence with a red number on the right cone of the pair and a white number on the left cone of the pair. The horse and cart must pass thru each pair of cones in order with the red number on the right without hitting a cone or dislodging the ball set on top of each cone. Knocking over a cone or dislodging a ball will incur 3 penalties. The pairs of cones are live at all times and passing thru any pair out of sequence will result in elimination. Prior to the competition the cones course is measure and maximum times are calculated for each level and size of horse. For each commenced second over the allowed time a half point penalty will be added. These penalties will be added to the total score. There is no trickery involved. Every competitor will be provided maps of the marathon course, the obstacles and the cones course prior to the show. Often copies of the required dressage test will be included although they are available on the ADS website. Competitors are also allowed to “walk the course” prior to the competition. They are free to map their course on their diagrams. Prior to the marathon there will generally be an official “course walk” where the show officials are on hand to answer any questions. The marathon course will be well marked for each division and getting lost is possible but difficult. After all three competitions are completed, the scores are added together to produce the final score. The competitor with the lowest score in each division is the winner of that division. In general, each Combined Driving Event is a standalone event. There are no year end World or National Shows. There are, however, some clubs that have their own year end awards for participation in their yearly events and ADS has now started to implement some incentive awards programs. Awards at events vary with organizer of the event but are generally ribbons, hearty congratulations from fellow competitors and a whole bunch of personal satisfaction. This article only touches on the higher points of a CDE but with this basic information you are ready to compete. The most important and difficult step you will have to make is to “Just do it”. You will find that drivers at these events are some of the friendliest people there are and are always willing to assist. If you still feel that you’re not ready, go volunteer at an event. I guarantee that you will be welcomed. It takes a lot of volunteers to put on an event and without volunteers, the show would not go on. Volunteers of any level of experience are always appreciated and you will have the best seat in the house plus a free lunch and possibly a T-Shirt. To find a list of ADS events in your area go to the ADS website, www.americandrivingsociety.org, and select the Omnibus. This will give you a list of all the ADS events. In addition, find the local ADS club in your area and attend a meeting or event. New people, whether you already drive or just have an interest in driving, are always welcome and they may offer many other events, seminars or educational programs that are not in the ADS Omnibus. Most of all, prepare to have fun.